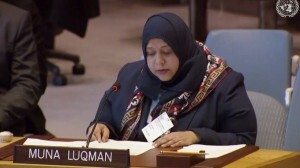 On April 15th, Ms. Muna Luqman, chairperson of Food4Humanity, co-founding member of the Women Solidarity Network, partner of the Peace Track Initiative, and WASL member has briefed the UN Security Council and the Office of the Special Envoy of the Secretary-General for Yemen. Luqman provided a brief on the situation in Yemen since the Stockholm Agreement was signed, and shared her experiences living, working and surviving in Yemen. She called for an immediate, comprehensive ceasefire; disarmament, demilitarization, & demobilization; the restoration of the government; and the inclusion of women by all negotiating parties by no less than 50%. End this devastating conflict and facilitate an immediate comprehensive ceasefire including the Saudi led Coalition air bombardment campaign and the Houthis missile and drone attacks within Yemen and cross-border, as well as, enforcing the Stockholm and prisoners exchange agreements and unconditionally releasing all arbitrarily detained civilians, and holding all the parties accountable, especially spoilers. Establish mechanisms to implement previous UN Security Council resolutions focusing on aspects related to disarmament and demobilization of Houthis, as well as, humanitarian access starting with operationalizing medical evacuations through Sana’a airport, eventually lifting the aerial, naval, and land blockade. Continue to adapt an approach to de-construct the conflict and localize the peace process, through creating local peace agreements in conflict areas, including in Taiz, that entails opening humanitarian corridors, as well as, withdrawal of fighters from the city and civilian institutions, and ensuring they are not redeployed to other fronts. Support the restoration of government institutions to full functionality, starting with liberated areas, including service delivery institutions such as the Social Welfare Fund, and support the government to address core conflict issues and grievances in areas under its control. Demand serious efforts to demilitarize liberated cities, ensuring the relocation of military depots and camps away from populated areas, as well as, facilitate the development of professional security forces that are well trained including in human rights. Urge for the disbursement of civil servants’ salaries in Houthi controlled areas by ensuring the government’s commitments based on 2014 civil servants’ lists. Demand that the negotiating parties include women in their delegations by no less than 50%, and the UN Special Envoy and Chair of the Redeployment Coordination Committee to consult regularly with women, and to ensure women’s meaningful inclusion in all peace processes, as well as, ensuring the use of stronger language in the Council products that is legally binding to demand an inclusive peace process emphasising the inclusion of women, youth, southerners, and other marginalized social groups.